Certain subjects were considered to be off limits for general discussion during the years of my youth, but the intervening period has seen those taboos lifted. It’s no longer unusual for people to talk about gender issues; politics can be a frequent conversation topic; and religion, or sometimes the lack of it, is also discussed more publicly than it was in the past. Perhaps faith matters were kept underground in earlier periods when aspects of the Catholic and Protestant divide were a stronger part of life in Australia but the increased infusion of people of faiths removed from those which are based on Christianity may have prompted more frequent discussions on matters of religion. While several commentators frequently promote their status as atheists and very few others choose to reveal their Christian links, it’s rare to find positive mainstream writings or electronic media debates that are linked to faith issues. Stephen Colbert is an exception. 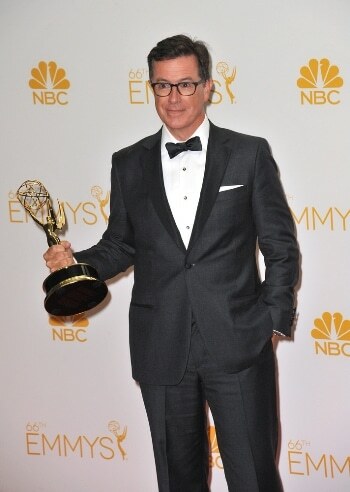 This former political satirist became the host of an evening television talk program on America’s CBS network last year following the retirement of long-time presenter David Letterman. Colbert is the youngest in a family of 11 children and is proud to present himself as a faithful Catholic. Last month Colbert devoted part of his show to a quiz contest called a “Catholic throw down” as part of an interview with actress Patricia Heaton who called on him to name seven places where the Our Lady has appeared. I didn’t catch the program “live” but a colleague drew attention to it and we noted that viewing it on the internet where the segment has gone “viral” is delivering audiences much larger than the usual numbers for The Late Show. Patricia Heaton, who plays Francis “Frankie” Heck in the US comedy series called The Middle and was Debra Barone in Everybody Loves Raymond, is also a practising Catholic who, like Colbert, is happy to promote that aspect of her life. Their cross quizzing of each other’s faith aspects resulted in a tied score after covering matters such as identifying the monstrance and the benefits of wearing a scapular, but drew most attention for Heaton’s request that Colbert name seven places where Marian apparitions occurred. He stopped at six, with coverage of their exchange noting that he had forgotten to mention the town of Knock in Ireland. It listed numerous other places, both confirmed and unconfirmed, where Our Lady is alleged to have appeared. Next Thursday will mark another anniversary of the first of 11 apparitions to Bernadette Soubirous during the month of February 1858 at a grotto near Lourdes in France. She claimed to see Mary a further seven times up to July of that year. After initial reluctance to accept her story, a Church investigation resulted in declaring Our Lady of Lourdes to be worthy of belief and Bernadette was canonised in 1933. My early school years saw the Sisters of St Joseph – exactly 100 years after the first apparition – present us with an opportunity to view slides of the shrine which was built at Lourdes, where the centenary was marked by Pope Pius XII issuing the encyclical Le pèlerinage de Lourdes (The pilgrimage to Lourdes). Life for some people in developed countries now sees them distanced from accepting concepts of Christian belief but that magazine story featuring Mary and the more recent discussion of religious issues on free-to-air television demonstrate that faith is very much alive for those who wish to embrace it. Mary’s cover from National Geographic was also given front page treatment here last year and Archbishop Anthony Fisher OP later reminded graduates at the University of Notre Dame: “The power of this woman was not political, military, financial or fashionable: it is her power to inspire, enlighten, encourage”. These are qualities which should never be off limits for us – yesterday, today or tomorrow. Previous articleAppointed to be a bishop, but… what happens when priests say no?